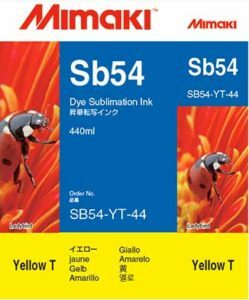 Bayinkjet and ImageTech carry a wide selection of Mimaki ink, including Mimaki Dye Sublimation SB4 inks. We are one of Northern California’s largest Mimaki dealers, specializing in sales, installation, and service of Mimaki wide-format printers. We also carry a full range of large format printing media compatible with the Mimaki dye-sublimation process, including banner and fabric media. Mimaki has attained the “ECO PASSPORT” certification from OEKO-TEX® international association headquartered in Switzerland, via Nissenken Quality Evaluation Center, for its “Sb54/310/410” and “Sb320/420”, sublimation inks.